The New Yorker magazine has gone where almost no one has dared to go before. 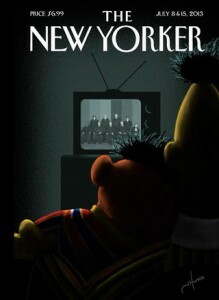 The new cover depicts Bert and Ernie from “Sesame Street” lovingly watching the Supreme Court on TV rule in favor of gay marriage. Bert and Ernie gay? When director Peter Spears went there in his 2002 short film “Ernest and Bertram,” Childrens’ Television Workshop shut him down instantly. Here is the banned Bert and Ernie movie. The movie ends with Ernie shooting himself in the head. From the video: A tragic love story between two heterosexually challenged muppets.